After a worldwide conflict that led to a chain reaction of events, civilization as we knew it ceased to exist and humanity is now at the brink of extinction. In this apocalyptic future, a group of survivors will try to raise hope for the human race by establishing a new civilized inception. 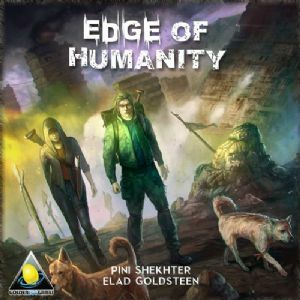 In Edge of Humanity, 2-5 survivors try to get enough Survival points (SP) to win the game. The game takes near 30 minutes of play and introduces a new take on deck-building, drafting, and hand management. The survivors explore and try to collect enough resources and draft new survivors to maintain their everyday living. They encounter each round of play a new event that may affect many facets of their upcoming rounds of play.